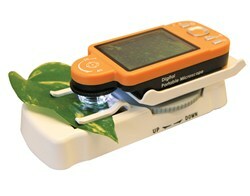 The 2 megapixel IPM Scope CAM2 allows you to capture high resolution pictures and videos in the field. View pictures instantly on the built-in LCD display and then transfer them via USB cable to a PC. The LED lighted unit features 10x and 40x optical zoom and up to 200x digital zoom. The scope has a battery life of up to 5 hours and includes an adjustable-height stand.